Day 6, Kiwi Experience: Rotorua. We left Waitomo at 8.30am and headed to Rotorua. On the way we had the chance to go to Hobbiton, the film set where they created some of the Lord of the Rings films. We decided against this trip as it cost $95 for two hours, I have never seen or read the books and Matt wasn’t too bothered either. It seemed like a waste just for a photo outside of a circular door. So we headed straight onto Rotorua via the bus with a few others who didn’t get off at Hobbiton and arrived at around 2pm, where we checked in and dumped our stuff. We spent the next couple of hours food shopping and other boring things before getting ready for the activity we had booked for the evening; a Maori Cultural Evening! 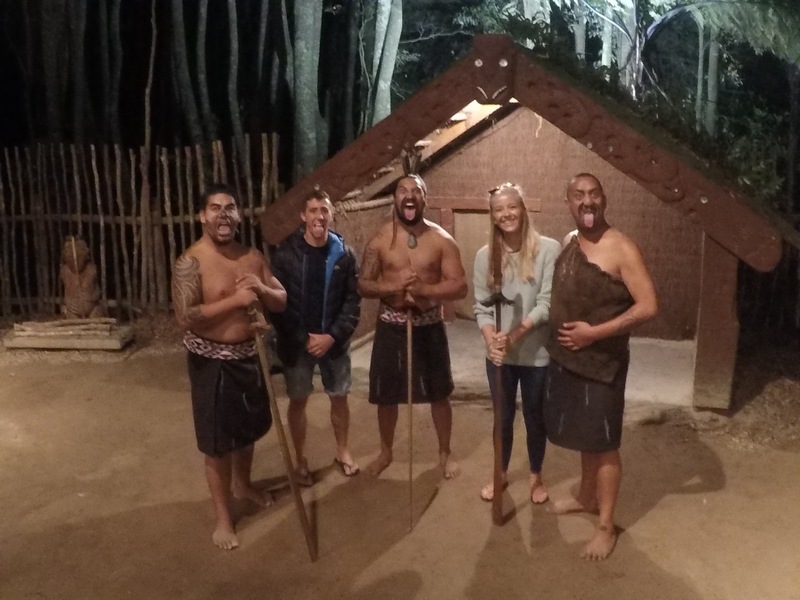 Claiming to be one the most rewarding tourist attractions in New Zealand, Tamaki village is a traditional Maori Village set up to educate visitors about ancient Maori ways, how the people came to New Zealand and also to share the Maori culture with the world. We opted for an evening in the village with dinner and a concert, and boy it didn’t disappoint! We arrived by bus to an amazing traditional welcome ceremony, the way that Maori warriors would greet strangers to their land; first with caution and then with friendliness as peace was asserted. We then spent an hour going around to various points in the village to learn various things about the Maori people. First up Matt had to learn the Haka, a Maori warrior practice used to scare the enemy away from battle (often now seen in rugby). We then heard about how the Maori people first discovered New Zealand, the meanings of their traditional face markings and the role that women play within the tribe (men do all the cooking which is epic). After this we headed into the concert room where we were treated to traditional singing and dancing, which was so amazing to watch, along with another Haka! Finally we were brought to the dining hall where I ate the best meal I have ever tasted. A traditional Maori buffet cooked in holes in ground due to the volcanic environment. I stuffed myself with lamb, chicken, fish, mussels, potato, veg and bread and still managed to leave room for pavlova at the end! The evening ended with more traditional singing and dancing before our buses dropped us off. If anyone is in New Zealand I would so recommend you do this! I honestly had the best night and it was so moving to know how proud the Maori people are of their ancestors and where they have come from. They really gave us an insight into what being Maori is all about and I think it may be the most culturally rewarding thing I will do while in New Zealand. 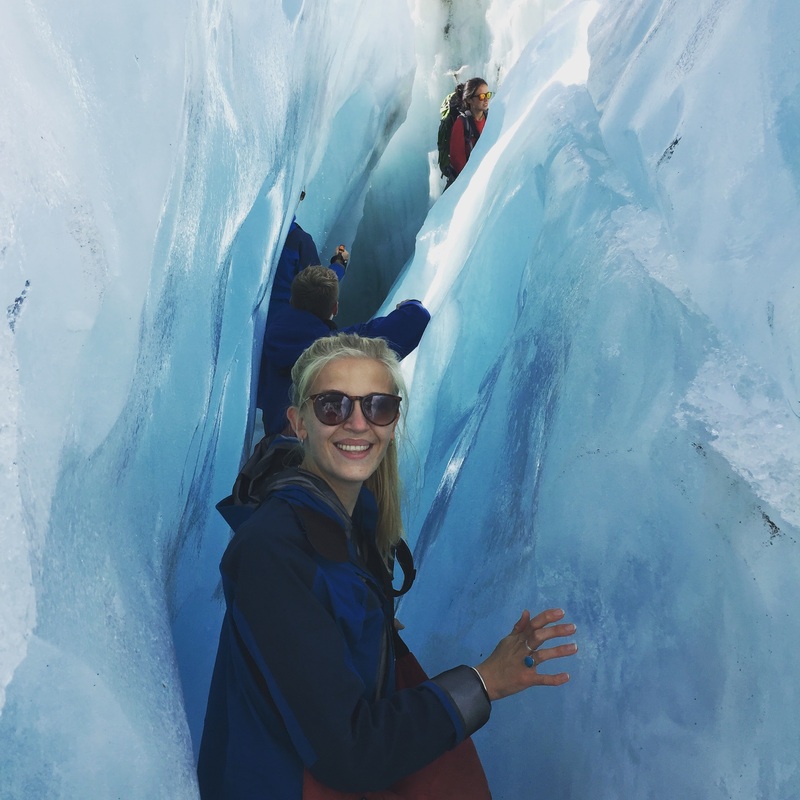 Day 7, Kiwi Experience – Enroute to Taupo. Sounds amazing – very envious I love it when the Haka is done – when you know the history it’s so moving. My aunt is originally from Rotorua – she’s Maori but now lives here in Wales but the whole Maori culture has fascinated me since I was absolutely tiny because of her. Your experience seems amazing — can’t wait to do it myself!